Chain Belt Company originated in the late-nineteenth century as a manufacturer of chain links designed to replace leather belts in driving large agricultural implements. Throughout the twentieth century, it diversified, improving the inner workings of machinery in a wide array of industries. The company’s success was largely attributed to the fact that its innovations were applied to the “conveying” of materials, a process that was essential in both heavy and light industries. 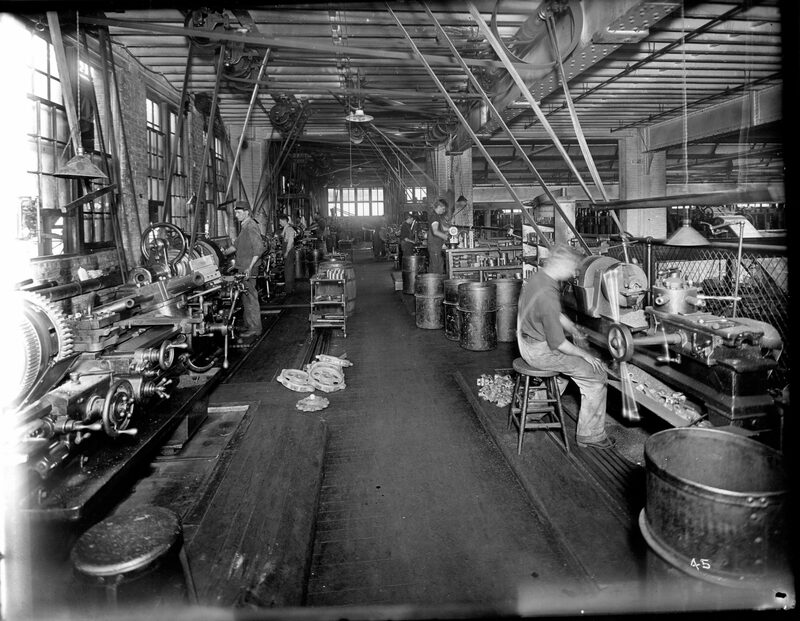 Like many other early industries that sprang up in the Menomonee Valley, this fledgling company was nurtured by another major Milwaukee manufacturer, Pawling & Harnischfeger (P&H). Christopher Levalley started Chain Belt on September 9, 1891, renting workspace at the original P&H shop with his partners, F.W. Sivyer and W.A. Draves. As business grew, they opened a new factory near the 16th Street viaduct, and in 1919 moved further west, buying a twenty-three acre tract in West Milwaukee. Chain belts drove most industrial equipment, and by 1920, “everywhere, in a hundred industries, the chain of this Milwaukee factory [was] bringing the raw and semi-raw materials from one pair of hands to the next.” Within the company’s first ten years, it began crafting chains to drive both elevators and conveyor belts. Levalley also developed chain-driven concrete mixers, revolutionizing the construction industry. In the 1910s, Chain Belt produced water screens, which were essential for power plants and blast furnaces that required clean, cool water in their condensers. It also developed a paver which was instrumental in the construction of roadways throughout the country as automobiles grew in popularity. 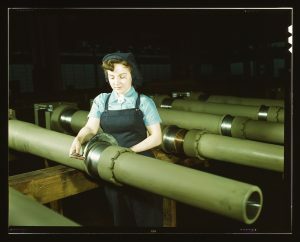 The onset of the Second World War brought a steady supply of defense contracts, eventually necessitating the addition of a new 320,000 square foot building on West Mitchell Street. Business continued to thrive in the post-war period. In 1959, the company expanded overseas into Europe and Japan, and into South America in the following year. It underwent a name change to Rex Chain Belt in 1964, reflecting the long-time use of the Rex trademark in their promotional materials. In the early 1970s, the firm became Rexnord after it acquired Nordberg Manufacturing. The economic recession of the early 1980s led to a hostile takeover by Cleveland’s Banner Industries in 1987. A few years later, however, Banner sold Chain Belt. Restored to its original vitality, Rexnord purchased another Milwaukee mainstay—the Falk Corporation—in 2005. ^ “From Rigid Iron to Flexible Chain Belt,” Milwaukee Journal, September 12, 1917, p. 14. ^ “Little Journeys to the Homes of Wisconsin Industries, Number Two—The Chain Belt Company,” Milwaukee Journal, May 23, 1920, p. 16. ^ “A Milwaukee Industry Building a New Plant,” Milwaukee Sentinel, October 6, 1919, p. 12. ^ “Chain Belt Co. Has Extensive Trade,” Milwaukee Journal, July 24, 1918, p. 9. According to another article, Chain Belt also helped to develop “the largest traveling screens in the world in the Ohio River at Cincinnati for the Union Gas and Electric Company…[with a] screening capacity of 200,000 gallons of water per minute.” The screen helped to keep the river from overflowing. See “Among Milwaukee’s Manufacturing Plants,” North Shore Bulletin, ed. by Luke Grant, 4, no. 12 (Chicago: Chicago and North Shore & Milwaukee Railroad, 1921), p. 11. ^ “Chain Belt Expanding Overseas,” Milwaukee Sentinel, July 1, 1959, 7, part 2. “Chain Belt Sets Up Foreign Firms,” Milwaukee Sentinel, August 18, 1960, 11, part 2. ^ “Chain Belt Takes New Firm Name,” Milwaukee Sentinel, January 23, 1964, 5, part 2.